Steve McClain is looking to keep the mojo going from his teams amazing romp all the way to OT of MWC Tournament championship game by adding a new assistant coach. That coach is David Farrar. 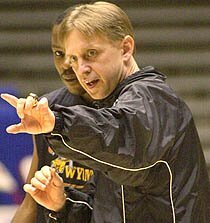 McClain actually worked for Farrar at Hutchinson JC and the two combined for a National title in 1988, Farrar has recently been a DI head coach at Middle Tennessee St and Idaho before spending last season as an assistant with South Alabama. At South Alabama Farrar found himself exactly where Wyoming wants to be, in the NCAA Tournament. "'I think anytime you have an opportunity to hire someone who's not only been a head coach at this level, but has been successful at this level, it strengthens your coaching staff and strengthens your entire program,' McClain said in a school release." This hire shows how serious McClain is about winning at Wyoming. It's dangerous anytime a coach who is on the hotseat brings in an assistant who has been a DI Head Coach. Makes it easy for the AD find your replacement. You've gotta love McClain.